After raising standard variable rates on interest only and investment property mortgages in 2016 and 2017, the big banks have recently unwound some of these increases. This has surprised some observers. So, what’s going on? The move can be explained by the banks’ response in meeting APRA’s macro prudential regulatory caps and the outcome of those actions. 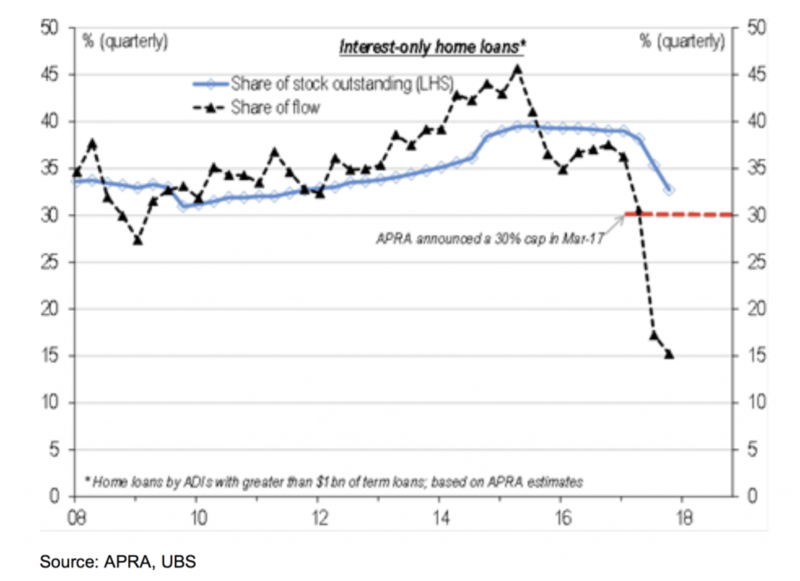 In March 2017, APRA announced a 30 per cent cap on the proportion of new mortgages that could be interest only. This cap came into effect in the September quarter of 2017. While APRA would have preferred to see the banks meet this requirement by restricting the volume of new interest only loans through the approval process, the banks took the right approach in a capitalist economy by rationing newly constrained supply by using the price mechanism. In other words, the banks increased variable mortgage rates on interest only loans to reduce demand for the product. This is basic microeconomics supply and demand theory. The problem was that the banks did not know how much interest rates needed to increase on interest only (IO) mortgages relative to principal and interest (P&I) loans to reduce demand for IO loans sufficiently to come in under APRA’s cap. The banks also faced one other complication in meeting the cap on a short term basis. Any application that was already approved as at 30 June but was settled in the September quarter was included in the cap. The banks decided to honour any loan applications that were approved prior to the announcement of the cap, leaving them even less room to write new IO loans in the September quarter and still come in under the 30 per cent cap. Given the implications of not meeting the new APRA requirements, the banks decided that if they were going to miss, they would miss to the low side of the cap. Therefore, they aggressively lifted IO mortgage rates, to ensure they reduced demand for IO mortgages by more than was necessary. In the end, the rate increases were far more successful in cutting demand for IO loans than expected, with new IO loans falling to around 15 per cent of new mortgages in the December quarter. The banks are now unwinding some of the increase in the price differential between IO and P&I variable mortgage rates given that they now have so much headroom under the cap. A similar thing is occurring in investment property loans. 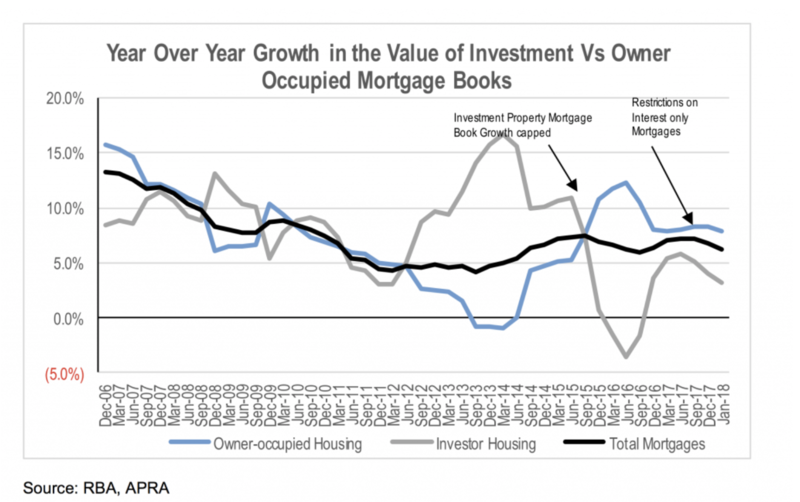 APRA imposed a 10% cap on growth in investment property loan books for the banks. The rate of growth in investment property loans has fallen significantly in recent months such that it is now in the low single digits. This allows the banks to get more aggressive in accelerating the growth rate of their investment property loan books while remaining under the cap. In terms of the implications for the banks, more aggressive pricing in IO and investment property loans could result in an acceleration in mortgage loan book growth. However, the offset is likely to be downward pressure on spreads due to the combination of the shift in mix to lower rate P&I loans, and a reduction in back book IO and investment property mortgages.